Forecast that the IT job market will grow by over 96K new positions in the remainder of 2019. (PRLEAP.COM) April 8, 2019 - Park City – UT – www.e-janco.com –IT Job Market is tight as more positions are open than qualified professionals are available to fill them. In order to address this, CIOs and HR departments have adjusted starting salaries and fringe benefits. This is causing some compression of pay grades for some key positions which is in turn impacting attrition rates. Growth of IT Job Market - In the first 3 months of 2019 20,600 new IT jobs were created. 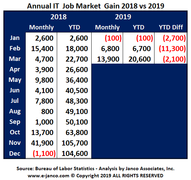 Janco estimates that 96,200 new IT jobs will be created in the remaining 9 months of 2019. The CEO of Janco Associates, Inc., Mr. M. Victor Janulaitis said, "With 20,600 new IT jobs created in the first 3 months of 2019, the market is tight. There is a skills shortage, some projects are missing key early benchmark dates due to lack of staffing. Many Blockchain and ERP positions remain unfilled and some organizations are seeing an increase in attrition rates for those positions as other continue to pirate away their best employees." He added, "This shortage is not limited to these disciplines. Programmers and business analysts of all stripes are also in high demand." Janco sees high demand for IT Professional staff and middle managers. Most companies have in place executive and senior management and there is not as much demand for those positions. Most of the demand and hiring is at staff levels for IT professionals for specific technology initiatives. Based on our current data we believe the hiring that will be targeted to be completed by mid-summer. This is based on the fact that many operational executives and CIOs have performance bonuses that include the implementation of new IT initiatives by year end. Demand for consultants and contract employees will still be above average, with an increase in the last two quarters of this year to augment staffing where there will continue to be a shortage of required staffing. Our data is compiled by reviewing public information, open/filled positions at our client organization, and interviews with selected CIOs, recruiters and our clients' internal HR staffs. The CEO stated, "In our monthly discussions with CIOs and recruiters we are seeing more frustration as it becomes more difficult to find qualified individuals. Everyone is concerned that as they fill positions, the individuals are qualified and will remain with them for some time." Janulaitis added, "To facilitate the recruiting process we have just released our 2019 IT Hiring Kit. It helps CIOs, recruiting managers, and HR departments to select, interview, and acquire the talent they need." The IT Hiring Kit comes with: 1) Interview Hiring Guide with sets of best practices, questions to ask and not ask, background check process, screening and interview process; 2) Latest IT Salary Survey; and 3) Up to 300 IT Job descriptions from CIO to Blockchain Developers. Also available is an update subscription service for a 1-year to a 2-year time period. The CEO said, "With the current growth of the IT job market and most enterprises planning on expanding the impact of technology external and internal operations, the outlook for IT professionals is bright."